This poem was chosen in response to Cheryl Gross’s art—can you talk about the experience of finding words that were in conversation with the image? What leapt out first from Cheryl’s art? A particular image? A mood? A line? Poet Lisa Allen Ortiz: In fact I wrote the poem in response to Gross’ drawing. I am a sucker for text in visual art, and I really liked the receipt she put on the right, and I like the illegible language on the bottom. I’m a great fan of illegible things. Of course the most eye-catching element of the drawing are the figures which are both child-like and a little distorted and frightening. I had been mourning the loss of our home movies (accidentally put in a good will bag while cleaning), and the odd figures reminded me of distorted children’s toys and thus of memories and what we lose with time. The receipt made me think about what memories are worth and how we can account for the loss of time and experience. What surprises you about Lisa’s poem in conversation with your art? Artist Cheryl Gross: I’m always surprised when someone picks up my work and responds to it. I particularly like the fact that she can see things in it that I don’t. Basically because I’m too close to it. Paired with the art, do you think the poem does something different or has a different tone? What did you expect a writer to pick up on from “Best Friends”? Artist Cheryl Gross: The relationship between the animal and the kid. It’s based on acceptance. Poet Lisa Allen Ortiz: Yes, just yesterday I started a poem about Cézanne’s card players. Evidently, Cézanne painted many card playing parties. I wondered if he painted them because they were a convenient subject (men sitting still) or if he was interested in the tension of the game. I have also written about Albrecht Dürer’s Hare drawing. I imagined his studio with that huge rabbit in it. I imagined the other subjects of his paintings lined up behind the rabbit. That was fun. I am charmed by the world the visual artists inhabit as they paint. My parents are both artists, so I grew up in a very visual environment. I’m interested in the imaginations of others. We all have different shapes and textures in our heads. Paired with the poem, do you think the art does something different or has a different tone? Artist Cheryl Gross: Yes. Her interpretation of the drawing is much different from what I intended it to be. I find this interesting and enlightening to get another person’s take on my work. Have you ever had a writer respond to your work before? What was the experience like? Artist Cheryl Gross: Yes. I work with the poet Nicelle Davis. We are Dharma bums wading through the sludge and reporting to the masses. If your poem were an animal, what would it be? If your art were an animal, what would it be? Artist Cheryl Gross: Naked mole rat. If your broadside collaboration were an animal, what would it be? Artist Cheryl Gross: Naked mole rat’s mother. Poet Lisa Allen Ortiz: Fiere by Jackie Kaye. Artist Cheryl Gross: No books lately. Just my regular Wikipedia snippets here and there regarding reference needed to carry out assignments. Poet Lisa Allen Ortiz: In Chicago last fall we went to the Art Institute and fell in love with Felix Gonzalez-Torres. Not just because you can take the candy. We love him for his mind. Artist Cheryl Gross: Pina by Wim Wenders, Whitney Biennial, OK Harris Gallery show: Bill Fisher, Larry Kagen. Lisa Allen Ortiz’s poignant calculations were the perfect counterpoint to the graphic and strange world of Cheryl Gross’s art. She gets at the sucker punch to the gut that loss can be (and which might be at the core of the boy in “Best Friends”). Together, the poem and art make strangeness, friendship, and tattered remnants speak of our lives. They make us familiar in a stranger’s eyes, strange again to ourselves, and they open us to new envisionings. It’s what we hope art will do. 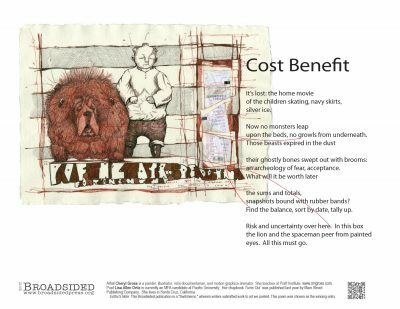 Note: “Cost Benefit” is the ninth Switcheroo feature from Broadsided. What is The Switcheroo? Every year, during National Poetry Month, we like to turn the tables and invite writers to respond to art we post, then publish the best collaborations. All Broadsided artists were invited to submit up to three pieces of work for the Switcheroo. We then asked Ira Joel Haber, the April, 2011 Switcheroo artist, to review the artwork, choosing one that he thought would be open to literary response and would work in the Broadsided format. He selected Cheryl Gross’s piece. I picked it because it was what I thought the most complex of the images submitted and the one that lends itself best to a written interpretation. There are a lot of separate images going on in the piece that might also appeal to writers. Artist Cheryl Gross is a painter, illustrator, mini-documentarian, and motion graphics animator. She has an MFA in New Forms from Pratt, where she now teaches. She writes: “When asked about my work, I always equate it with creating an environment transforming my inner thoughts into reality. Much like an architect or urban planner, that reality and humor becomes the foundation of the work. Beginning with the physical process, I work in layers. Born and raised in Brooklyn, New York, my urban influence has indeed added an “edge” to my work. Coming from a totally vertical and intense environment, I now live in Jersey City, NJ.” www.cmgross.com. Image: “Best Friends,” 12″ x 17″, handmade paper, ball point, graphite, India ink. Poet Lisa Allen Ortiz is currently an MFA candidate at Pacific University. Her poems have appeared in Zyzzyva, The Literary Review and Crab Orchard Review, and her chapbook Turns Out was published last year by Main Street Publishing Company. She lives in Santa Cruz, California.